Albon is a prescription antibiotic drug. It is used for the treatment of certain bacterial infections as well as treatment of coccidiosis, a protozoal infection of the intestinal tract. Who is it for? For in cats and dogs, and may be prescribed for other species. Albon is prescribed as a general antiprotozoal for the treatment of coccidiosis, a protozoal infection of the intestinal tract. 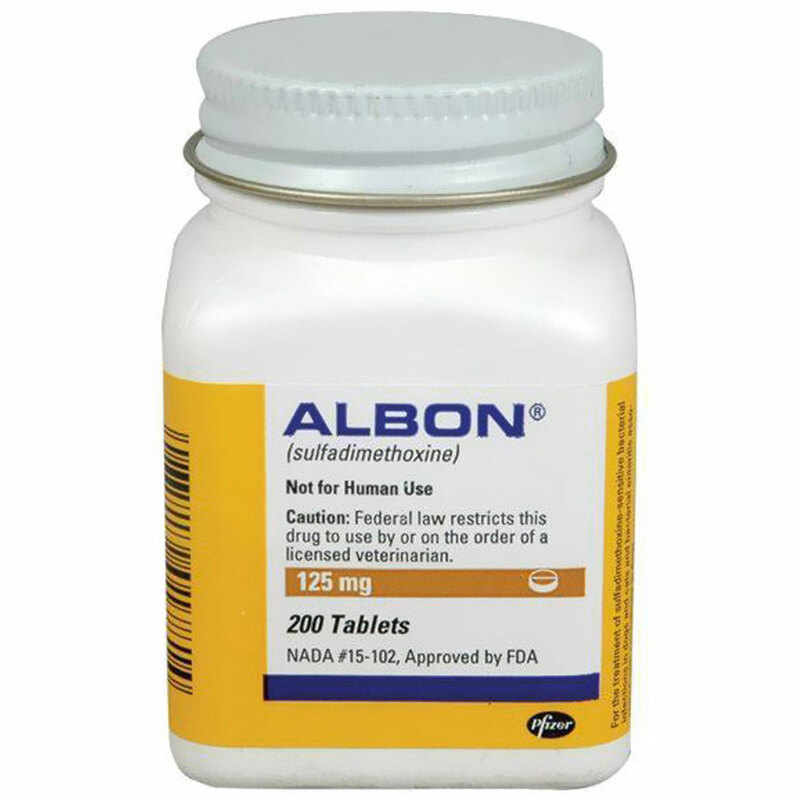 Albon is also prescribed for the treatment of a wide range of susceptible bacterial infections. Liquid is a palatable custard flavor, and tablets are available in a variety of strengths. How does Albon work? This medication works by inhibiting the production of folic acid in bacteria. Without folic acid, bacteria and coccidia cannot make essential proteins and eventually die. Albon tablets and oral suspension are given by mouth and may be given with food. Encourage your pet to drink water when taking Albon to prevent crystals from forming in the urine. Always follow the dosage instructions provided by your veterinarian. If you have difficulty giving the medication, contact your veterinarian. Use all of the medication prescribed, even if your pet appears well. If the entire course of treatment is not given, the infection may recur or worsen. View Albon Drug Facts Sheet. What results can I expect? Albon is absorbed well from the digestive system and is distributed to many body tissues, making it effective against infections in multiple organs. It is active against many different types of bacteria. It is usually given once a day for some days. If doses are missed, or the entire treatment regimen is not completed, the infection could recur or worsen. Consult your veterinarian if the animal's condition does not improve or worsens after beginning treatment with Albon. What should I do if I miss a dose? If you miss a dose, give it as soon as you remember. If it is almost time for the next dose, skip the one you missed and go back to the regular schedule. Do not give two doses at once. Who should not take it? Not for use in animals who are hypersensitive (allergic) to it or other sulfa drugs. Not for use in animals with dehydration. Use with caution in animals with bladder or kidney stones, or liver or kidney disease. Not for use in pregnant or lactating animals (female animals nursing their young) unless benefits outweigh the risks. This medication should only be given to the pet for which it was prescribed. What side effects may be seen when taking Albon? It is common to find sulfa crystals in the animal's urine during a urinalysis (a test on the urine), which is not a problem in animals that remain well hydrated. Theoretically, keratoconjunctivitis sicca (KCS, dry eye) could occur in dogs with long-term use of Albon. Stop giving the medication and consult your veterinarian if your pet experiences discharge from the eye, redness of the eye, squinting, or other signs related to the eye. Uncommon side effects include anemia resulting in pale gums and tiredness; low platelets resulting in bleeding tendencies; fever; loss of appetite, vomiting or diarrhea; joint inflammation (arthritis) resulting in lameness; kidney damage resulting in increased thirst and urination; and skin rashes with possible sensitivity to sunlight. What should I do if I know of or suspect there has been an overdose? If an overdose should occur, you may see signs listed in the side effects (above). If you observe any of these signs or know or suspect your pet has had an overdose, contact your veterinarian immediately. What should I avoid when giving my pet Albon? Consult your veterinarian before using sulfadimethoxine with other medications including vitamins and supplements and antacids since interactions may occur.